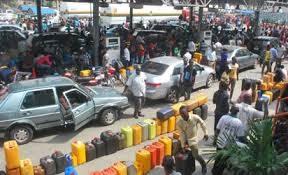 The Department of Petroleum Resources (DPR) is getting tough with marketers found to be hoarding fuel as the current scarcity bites harder nationwide. At the last count, no fewer than 48 filling stations have been shut down in Delta, Kwara and Ekiti states alone. However, the price of petrol rose to N400 per litre yesterday in Abuja as more citizens travelled out of their stations for the Christmas celebration. Many motorists even passed the night at filling stations in the Federal Capital Territory (FCT) in their desperation to buy fuel. It’s between N200 and N250 per litre in Lagos and Ogun states.